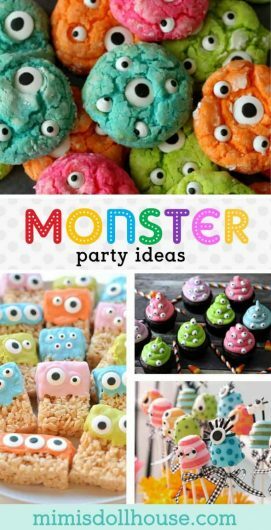 Monster Party: Monster Birthday Party Ideas and Desserts. 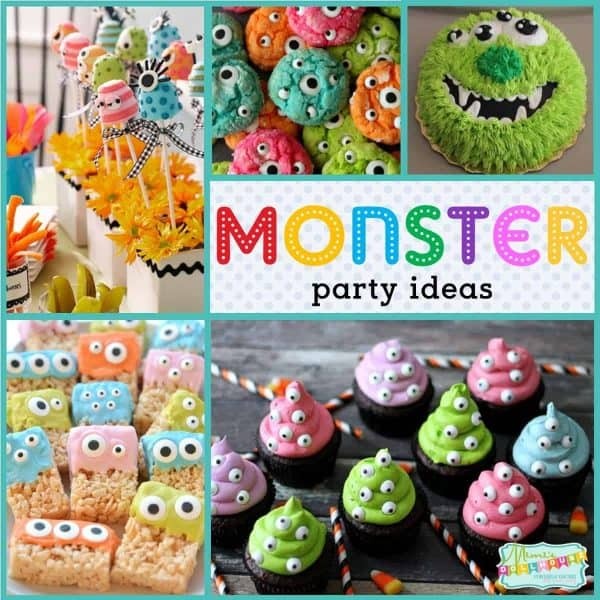 I’m sharing some absolutely amazing Monster party ideas. I love the monster theme and how creative you can be with it. 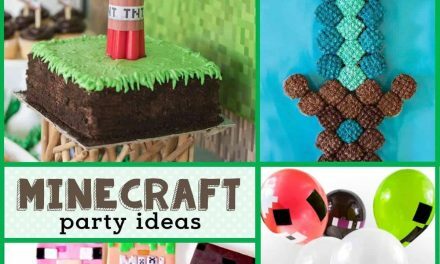 These monster birthday party ideas are perfect for a boy or a girl and are sure to make for a “Roar-some” time. Looking for more monster party treats? Also check out this monster party, this monster birthday party, and this monster bash! So…I’m a nicknamer. I nick name everything and everybody. Especially my kids. My husband shakes his head from time to time and wonders aloud why we spent sooooooo much time choosing the perfect names for our kids just so I could never use them. I can’t explain it. I’m just a nicknamer. ☑️ These Monster Party Supplies are the perfect set to get your party planning headed in the right direction! Lately, my littlest one has been given a new moniker… Monster. I have been trying to talk the stubborn little miss into a Monster Themed 3rd birthday for weeks. Time will tell. 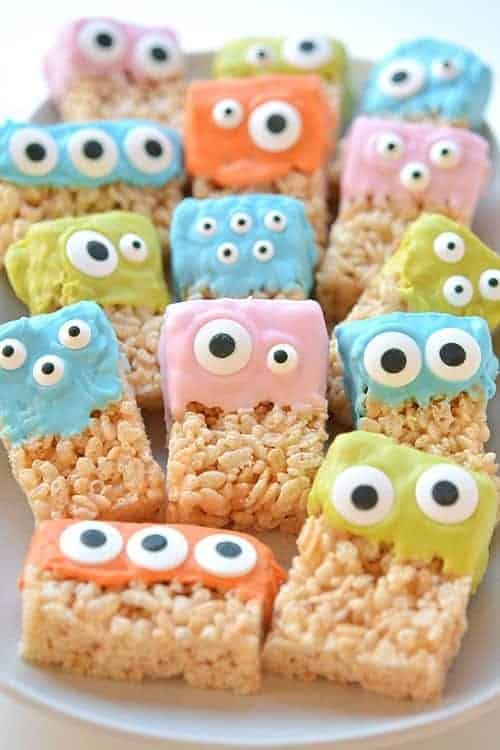 So not only are these rice krispie monsters seriously the cutest things ever…but they are super, super simple to make. My favorite kind of party treat!!! Go…make these…now!! There is nothing quite so fun as a photo booth. Am I right, or am I right? 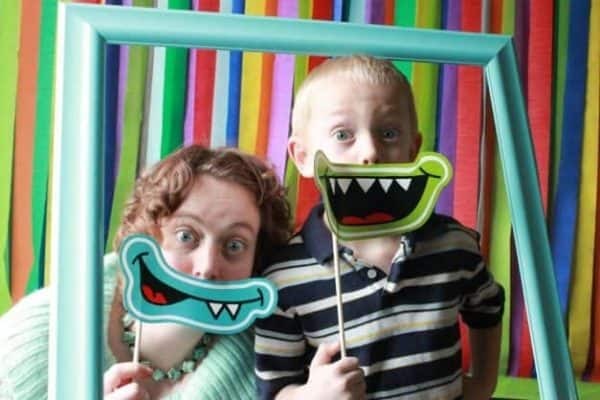 These fun monster mouth photo props are easy to print and cut and make for the perfect opportunity to capture moments from your party. This is where the guests show their wacky personalities. 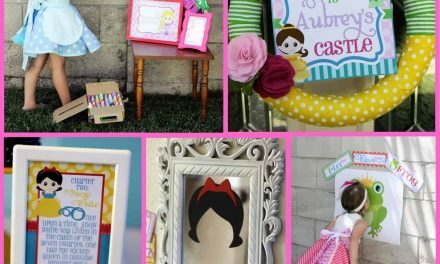 Awesome monster birthday party ideas!! 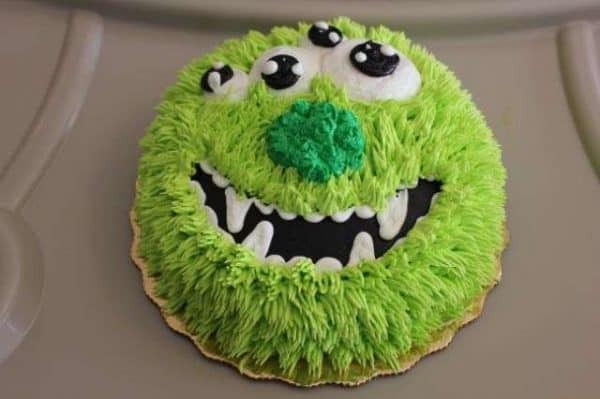 Isn’t this a super fun monster cake? I love the “furry” frosting and the mismatched eyes! Super duper cute! I just can’t get enough of the monstery teeth!!! These are great cookies if you are looking to purchase cookies. I love splurging on cookies…so much less pressure to let someone who is a pro at cookie decorating to do them for you! 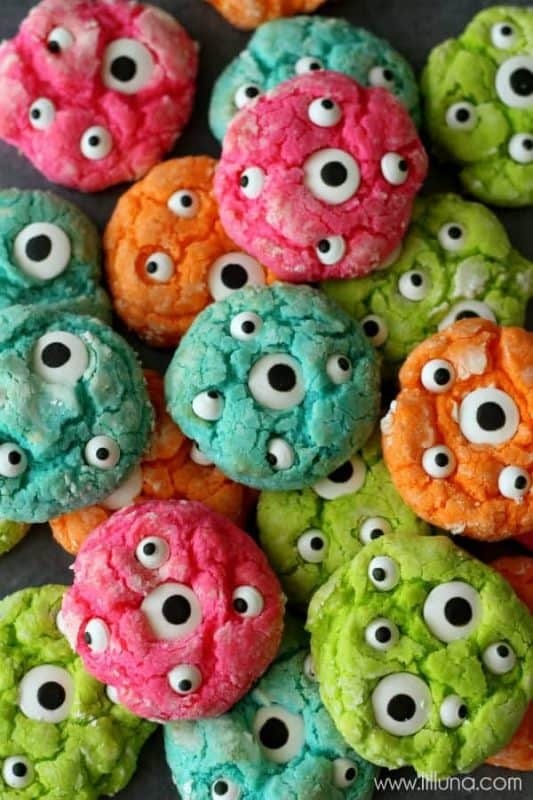 These are adorable monster cookies!! Here is a great photo booth idea. 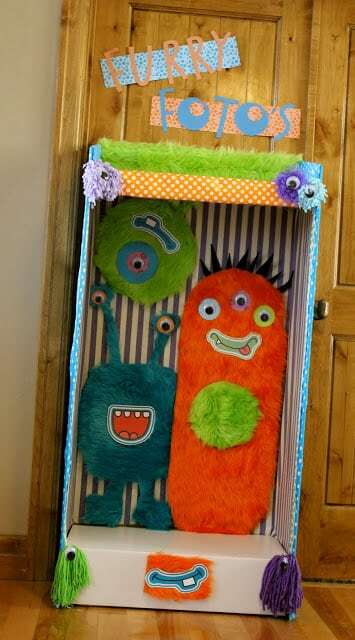 Pair these fun photo booth with the monster mouths and let your party guests go nuts! I love the fur trim and the friendly monsters inside. Oh my cuteness! I think I love these cupcakes most of all. They are so adorably cute…they are almost scary cute! These easy to make monster cupcakes are perfect for a monster birthday party (or even Halloween) and they can be made in any color…just add candy eyes!!! Winning! Looking for an easy way to decorate your monster birthday party. 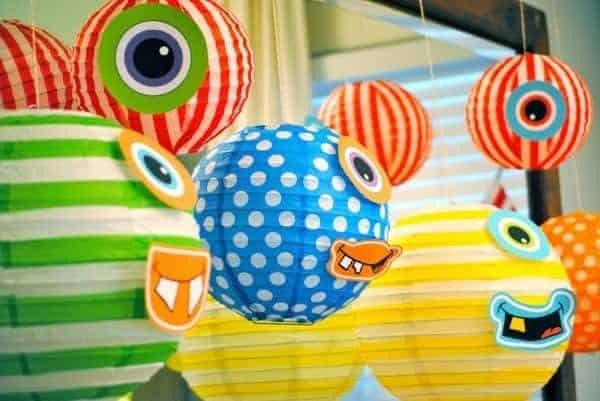 Grab some paper lanterns (solid or patterned) and glue on the monster printable eyes and mouths and you have super clever hanging monsters! So fun!! I love, love, love mini cookies. They are super fun to put in glass jars on party tables (see mermaid party for ideas). 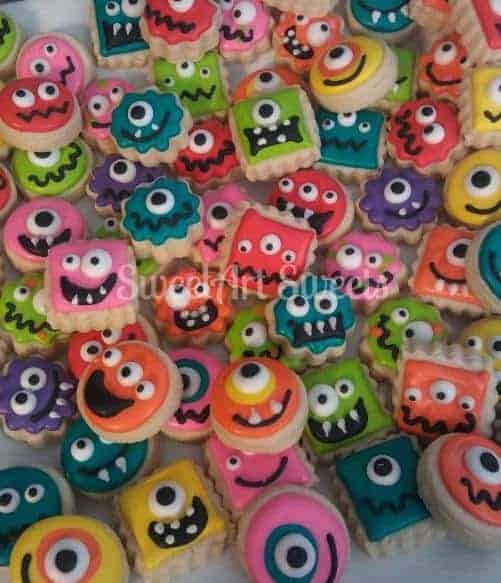 These cute little monster party mini cookies are fun and clever and if you have never tried Sweet Art Sweets cookies…trust me, they are yummy! These fun and clever monster brownie pops are absolute perfection. Baked in a small muffin tin and covered in various colors and cut shaped of fondant. How can you NOT love these colorful monsters?? 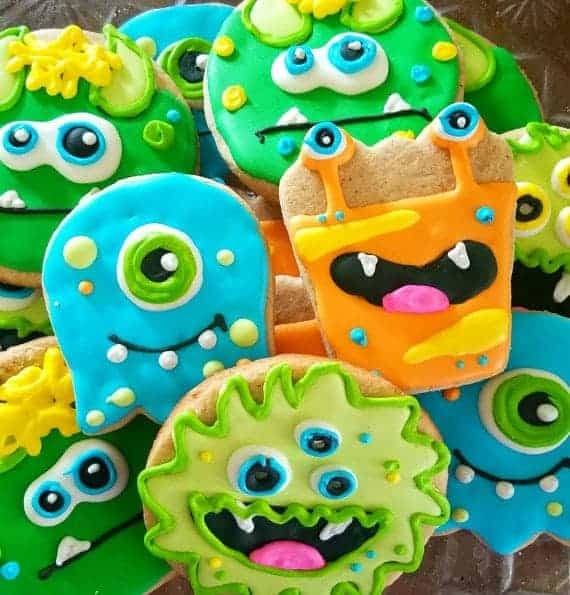 More candy eyes to love…these monster party cookies are so adorable and absolute perfection for a monster birthday party. I love the bright colors and the different sized eyes. So stinking cute!!! I hope you loved these monster birthday party ideas as much as I did!! Looking for more monster party treats? Also check out this monster party, this monster birthday party, and this monster bash! Hi! 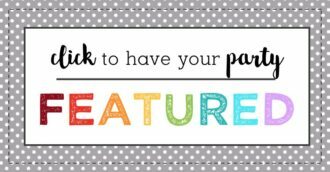 I was just looking at this monster party pack for my child and i saw your add on etsy about getting it for free if i will have a professional photographer take pictures of the props set up at the party, Are you still looking for this? if so I will have a photographer at my sons 3rd party :) Thank you! Hi! I was asked by my granddaughter to make the stuffed blue monster for her daughter’s 3rd birthday. I am challenged when it comes to making my own pattern. Is there a printable pattern for the monster face? I would really appreciate a copy if at all possible. Thank you! I love the monster idea with all the googly eyes! The cookies and ricecrispy treats look phenomenal! The whole monster brownie set up is so cute. The lantern too so adorable. I love colorful party, it bright out the whole room! Those little eyes on the krispies treats are so adoroable and make me think of monster.com animation. Once again, great theme. Thanks for sharing this beautiful idea. I have always wanted to have a monster themed party. It just looks really fun. This is very timely since I am celebrating my birthday in 3 weeks. I am now 75% decided to use this theme. 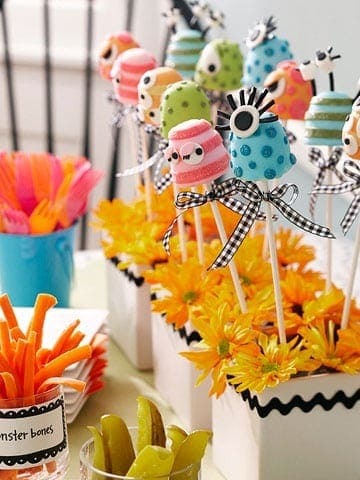 Who would have thought monsters could be cute and so brightly colored for a birthday celebration? I think this is possibly my favourite one yet. Though I am sure with your creative mind you will always amaze me. I love love all the brightly coloured monsters here. It looks like a great party indeed! What’s so great about this, is that you have it ready to be offered for both gender related color fields. I find this theme to be highly adorable. I did a monster/numbers theme for my son a few years ago but wasn’t this cute. I love it!! I love these, they are so colorful! My son was talking about having a monster birthday, thanks for sharing all these ideas. 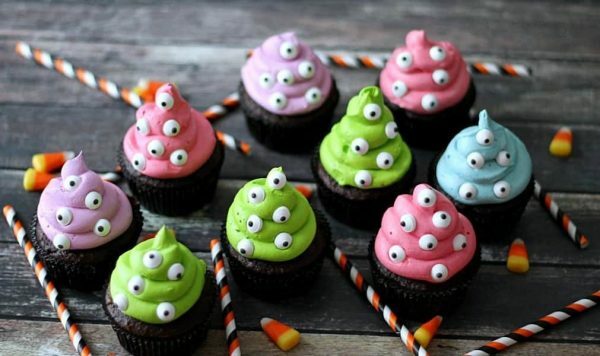 I love all the googly eyes on all the cakes and treats – makes some very cute monsters!! I love all the ideas. 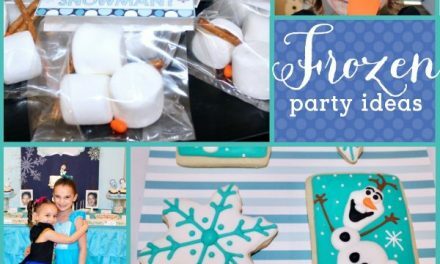 Party planning can be so fun! I especially love the cake and cupcakes! Fun ideas! I really want to try the rice krispies one. Thanks for these. I’m sure I’ll be utilizing them all soon!